Few brands in any consumer category can feature a consistent look across all of its products that set those products apart from the crowd. Lexus is one of those few. From the futuristic luxury of each vehicle exterior to the luxury that awaits inside, each model in today’s fleet is distinctly Lexus. 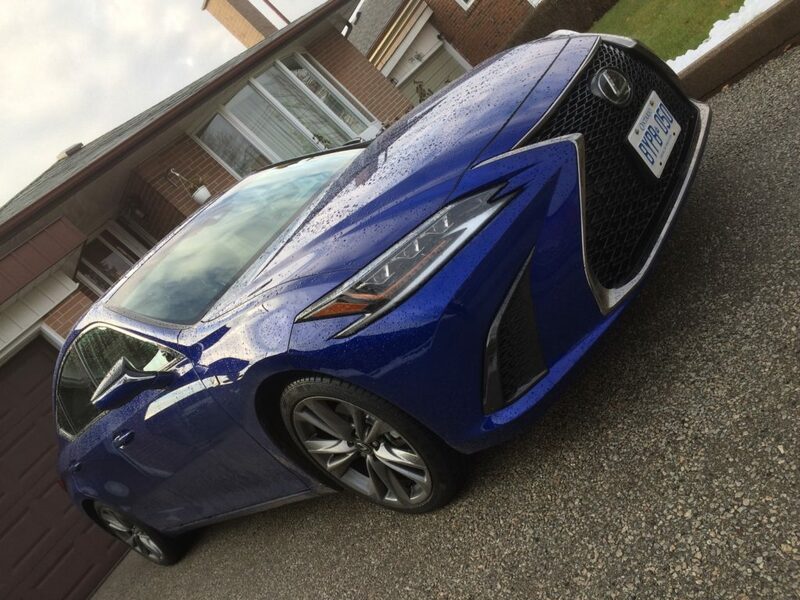 I spent a week with the 2019 Lexus ES 350 sedan to experience the brand for myself. The Ultrasonic Blue Mica 2.0 model I drove continues with the Lexus evolution towards a high-tech yet luxurious look. The distinctive (and massive) Lexus grill serves as the starting point for many of the creases and curves that run the length of the body, right to the rear spoiler and the integrated twin exhaust pipes. The prominently angled side mirrors feature a slightly hexagonal shape similar to that of the key fob. F-Sport badging lets onlookers know you’re driving a go-fast version of the ES 350. This is the first ES that Lexus as given the F Sport treatment to. F-Sport badging stamped into the headrests is just one of many eye-pleasing style details in the cabin. 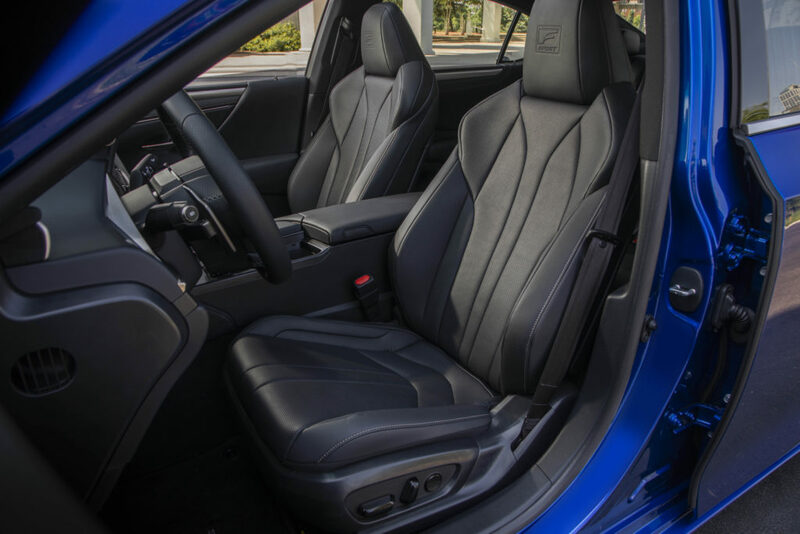 Leather adorns the dash, doors, shift knob, heated steering wheel, and of course the heated and cooled three-memory bucket seats. Driver preference memory settings include the power side mirrors. You can program the driver’s seat to move all the way back and the steering wheel to move all the way forward when you kill the engine, making it easier to get out of the ES 350. Seat and wheel resume their programmed positions when you start the engine. 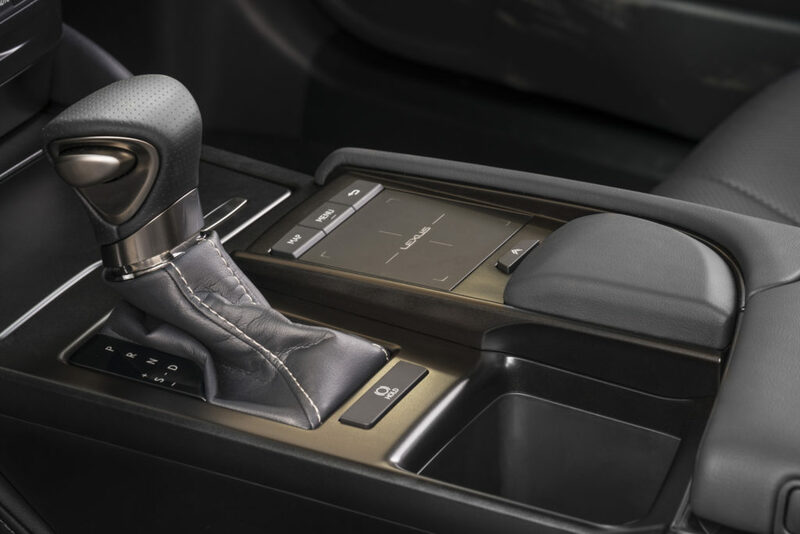 Note: elements like the heated steering wheel are part of the $6,000 F Sport 2 package. I won’t differentiate between F Sport package amenities and “base” features (that seems like the wrong word to use for the ES 350). Front seats are roomy, while the sloping roof takes away headspace for rear seat occupants. 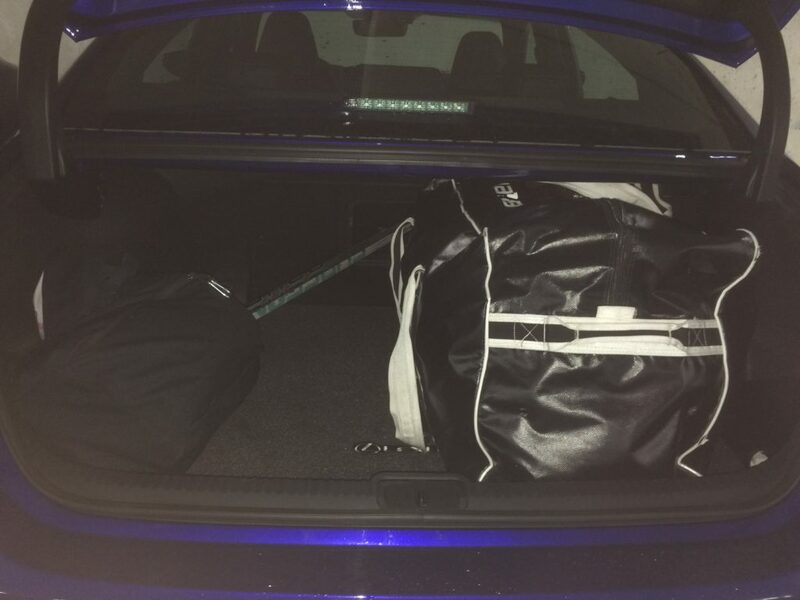 The 350’s trunk easily fits my bag and would likely take another of equal size. Sticks went through the armrest hole. It seems like the 350’s seats don’t fold down. Seen from outside, the 12.3” display screen positively dominates the middle of the dash. Once you sit in the car, though, it looks just right. It’s the portal for the Enform Audio suite of infotainment technologies, like navigation, weather, fuel prices and so forth. The system also supports Apple CarPlay. Lexus moved its analog clock to the left of the screen. The right frame may display icons, like a note about passenger seat airbag activation, but otherwise it stays dark. Climate control buttons reside just below the screen. Each time you touch one, the change you want registers on the screen above. Just below these buttons are four infotainment buttons and an on/off/volume knob. The cumulative effect is one of well-appointed functional minimalism. Ergonomics: to use the trackpad, the driver or passenger rests the forearm on the centre armrest and the palm on a palmrest adjacent to the trackpad. The latter reminds me of once-ubiquitous mouse pads that featured this palmrest. Looks: At night, the Lexus branding in the middle of the trackpad and the crosshair-like lines that frame it glow. The effect is high-tech and, dare I say it, cool. A 10-inch heads-up display reduces the need to glance at the screen or the instrument cluster. The latter is surprisingly compact given the technology Lexus crammed into the ES 350. The entirely digital cluster lays out essential information in a logical, colourful format that the driver can read quickly. Here’s a neat tech detail: press the settings button on the steering wheel with your left thumb and the tachometer circle audibly slides to the right, making room to the left for vehicle settings. Press the setting button again and the tach circle slides back to the centre of the all-digital display. A 6-cylinder 3.5-litre 302-horsepower engine drives the front wheels through an eight-speed automatic transmission. Lexus provides paddle shifters if you want to take that responsibility away from the car. On-ramp acceleration is what you’d expect. The roar of the engine only reaches the cabin if the foot on the accelerator gets agressive. Once on the highway, the ES 350 provides a quiet, civilized ride. You can thank active noise control for the quiet. An adaptive variable suspension irons out most bumps and reduces sway on curves. 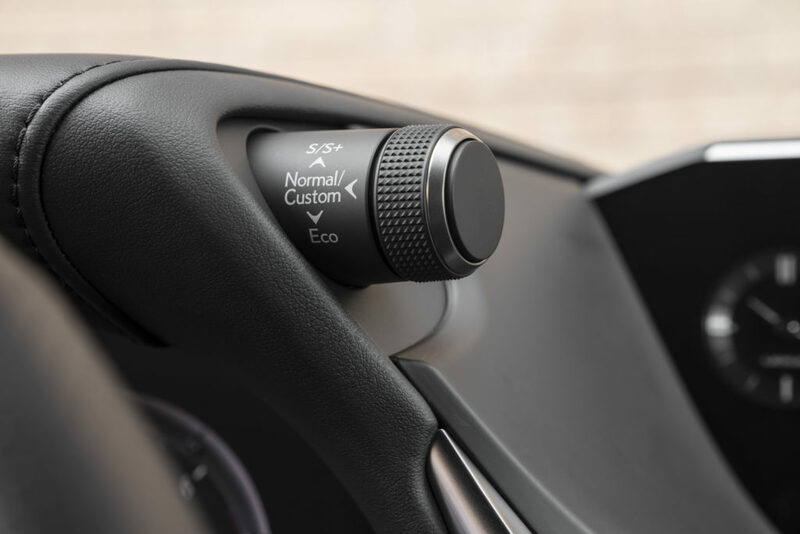 The car keeps a respectable following distance when you use the dynamic radar cruise control. This system will start from a stop of less than about 2 seconds, making it ideal for commutes on clogged roads. 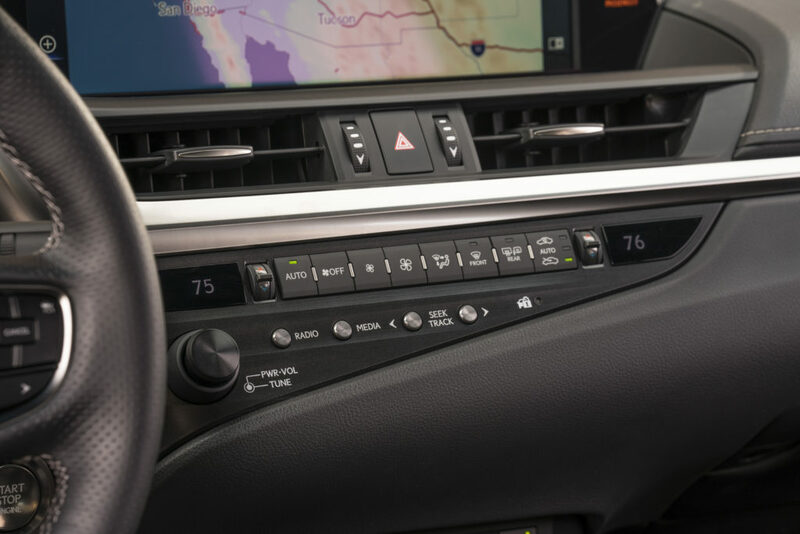 The ES 350 features a drive mode switch above and to the right of the instrument cluster. This knob turns up for Sport, down for Eco, and serves as a button for Normal. I don’t recall seeing controls in this particular spot in other cars, but it proved easy enough to reach. It seems like a great place for seldom-used controls. There’s a similarly shaped button to the left you can use to turn traction control off. 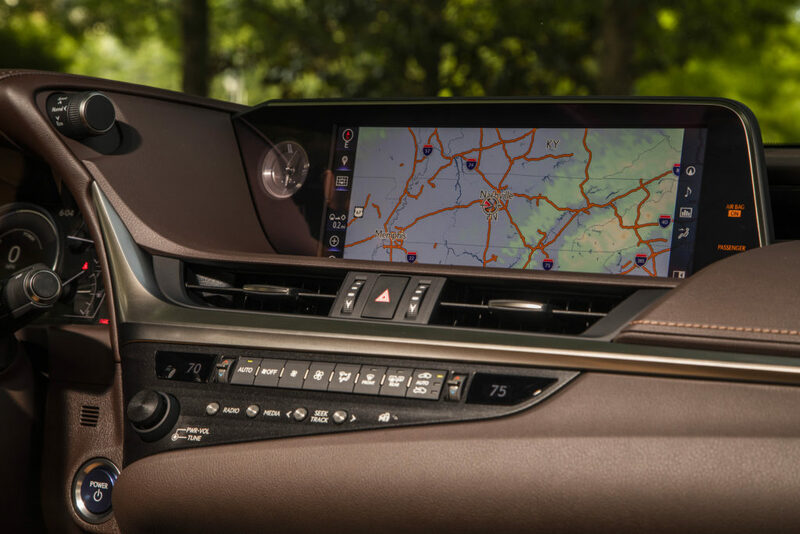 A comprehensive suite of technologies makes up the Lexus Safety System+ 2.0. These range form a pre-collision system that detects pedestrians and bicycles, a lane departure alert with steering assist and road edge detection. Base MSRP for the 2019 Lexus ES 350 is $48,800. With options and other charges, my tester’s MSRP came to $57,651.